Bad Boyes : A story of a public school where one of the pupils was called Boyes who was bad (pranks, scrapes, the kind of things boys get up to in kids TV). 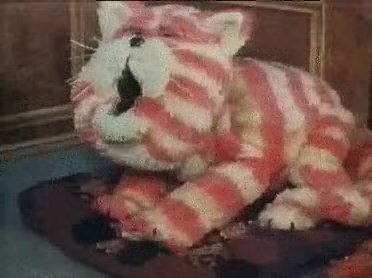 Bagpuss : Voted as the best BBC Kids programme of all time. Pink cloth cat that scared the hell out of my mate Chris (his e-mail address can be supplied). Starred Gabriel the banjo wielding Toad (sorry Phill), Madeleine the rag-doll, a woodpecker called Professor Yaffle who was a talking book-end and lots of mice who lived in the marvellous, mechanical, mouse-organ. The mice were hell-bent on heaving everything. Strange how the bigger characters never moved anything! Each episode started with Emily, the very young shop owner, bringing a new item for Bagpuss to look at. OLD FAT, FURRY, CAT PUSS. OH BAGPUSS, HEAR WHAT I SING. Bananaman : There once was an ordinary young boy called Eric but when Eric bit into a banana, an amazing transformation occurred. Eric is Bananaman! Cool eh! Eric lived at 29 Acaica Avenue General Blight, and Dr Gloom were a couple of the baddies involved. Whilst in the guise of Bananaman, he would have a crush on TV newsreader, Fiona. Banana Splits : Bingo, Fleegle, Drooper and Snorky. One of the most memorable theme tunes and a genuinly funny programme. I always enjoyed the car chase at the end with someone always falling for the "My cars broken down" joke. Barnaby The Bear : An orange bear with a white face. Appeared at lunchtime in the early 70's. Quite a lot of marketing for the time as you could get hand puppets and place mats. Barbapapa: Morphing prelude to the "New Shmoo". Old Baba' was a pink blob that could change into any shape that he wished accompanied by Babamama and black furry Babasomething or other. very akin to play doh on acid. Batfink: Who's wings are like a shield of steel. Helped by Kung Fu side kick Karate who was a bit of a lardy really. His "Super Sonic Sonar" helped catch the thieves (usually Hugo Agogo) as his black sonic "beeps" chased the target. Catchy theme tune. Had a very deep voice for a bat though. Battle Of The Planets : So early into the alphabet and possibly the greatest show ever, Stirring theme tune, great stories, loathsome enemies. Ah yesterday! 1 Rover 1 - Gave 7 Zark 7 a hand. Mark - Flew a plane. Jason - Drove a racing car. Princess - Rode a motorbike. Keyop - Drove a egg-shaped car thing and spoke funny. A Bear Called Jeremy : This was an ultra cool show about a bear named Jeremy that was made in some sort of stop motion animation. Jeremy went through all sorts of adventures. Beat The Teacher : Mark Curry, who went on to present Blue Peter, was the longest serving host of this pupils v. teachers game of Noughts and Crosses. You had to get a question right to get on the board though. The original presenter was Paul Jones, once of Manfred Man and later featured Howard Stapleton (before moving onto Tomorrow's World, where he'd fall off a swing). Belle and Sabastian : This was a Japanese animation about a boy and his huge white dog (who all the villagers are afraid of because of her enormous size) who live and have adventures in the Pyrenean mountains. I think (if I remember correctly) that he and the dog run away from home to find his Mother. Benji, Zax and the Alien Prince: Small boy and robot land on Earth, travel around America, meet dog, have adventures. Not too taxing really is it! There was some evil bad guy after our regal hero who drove around in a black car and would always try to shoot the robot (Zax) but not our regal hero. Bertha : A big green machine that could make anything that Spottiswoods factory needed to make. Some of the weirdest hair-dos ever to be seen on puppets in this programme. Voiced by the mighty Roy Kinnear. Black Beauty : Kids drama at it's best and a reason why ITV should continue to make children's programmes because, when they put their mind to it, they can do a really good job. Anna Sewell's classic novel was the base behind the programme obviously but the star of the show stayed with the same family throughout. Well worth revisiting. I have (somewhere) the official soundtrack of the TV show on LP (hi kids!) somewhere. It's where the picture on the right came from. Blue Peter : Adults liked Blue Peter. it was safe, there was no violence, no threat of corrupting young minds and it taught you things. Crap really but always manages to give a new section for "It'll be alright on the night", elephants crapping on the floor, brownies starting fires etc. Made front page news in 1998 with the Cocaine Fiend. Quite a news worthy programme in the past with the death of Petra, the vandalising of the Blue Peter Garden and Janet Ellis announcing live on air that she'd be needing maternity leave. Bod : The excellent Bod stuck rigidly to the "repeat and learn" ethic of the time. Keep going over stuff and the kids will learn whilst having fun. Despite what many think, there were only ever 13 episodes of Bod made, they were just repeated over and over by the BBC. John Le Mesurier would describe the arrivial of all the characters one after the other. 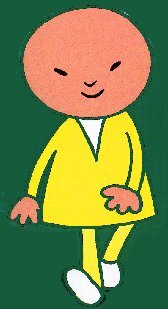 First would be Bod, usually followed by Aunt Flo, PC Copper, Frank the postman and Farmer Barlymow. One of the more memorable moments of the programme was the animal orchestra (voiced by Maggie Henderson). The frog conductor, Alberto would always have a milkshake after the performance. Each animal in the band would have a guess before the decision was made. "I think I'll have...chocolate." "Bod and PC Copper (long pause) No (pause) that's not snap. "Bod and Bod (pause) that's two Bods (long pause) Snap!". Oh well done! The Book Tower : Yes, of course the book tower. Tom Baker looking moody and reading books. Some actually had parts of them made into live action. A fantastic theme tune written by Andrew Lloyd Webber. Bravestar : Thanks for all the corrections for this one! Marshall Bravestar, our hero, could call upon special powers as required. The strength of a bear, the eyes of a hawk, the ears of a wolf and the speed of a pooomaaa (puma). Box Of Delights : The Sunday afternoons leading up to Christmas used to be rather special. The BBC would show a multi-part drama series finishing the weekend before Christmas and millions would watch. "The Lion, The Witch and The Wardrobe" is probably the best remembered but this comes a close second. A wonderful story and (for the time) state of the art special effects came to life and you couldn't help feel disappointed when it finished for another week. I cannot recommend the DVD highly enough. 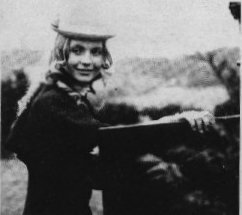 Brendan Chase : a drama set in the 1920's about a couple of kids who run away and try to survive in a large forest, hunting for all their food. Bric-a-Brac : Brian Cant method acting as an old geezer in a junk shop. Every week the stuff in the shop would begin with the same letter? Old man Steptoe was never like this! Button Moon : Mr and Mrs Spoon, Eggbert and the spoon's daughter, Tina T-Spoon. It's amazing how much he could see through the telescope back to Earth.